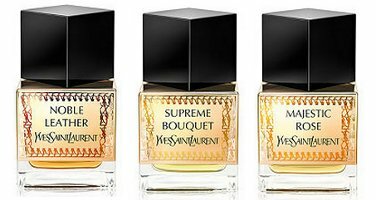 Yves Saint Laurent has launched the Oriental Collection, a new trio of fragrances — Noble Leather, Supreme Bouquet and Majestic Rose. Yves Saint Laurent has drawn its inspiration from the splendours of the East to give birth to an exceptional collection. In honour of its creator and his never-ending passion for the elsewhere, the oriental collection celebrates the mysteries and refinement of a land of infinite richness. Noble Leather ~ "The potent and deep scent of leather fervently states its case and whispers an elegant, raw and carnal sensuality. The ambery wood accord embraces languid vanilla and the earthy scents of patchouli before giving way to intermingling tanned leathers. Enhanced by a dash of bright saffron notes and softened by the candied sweetness of the dried fruit accord, this skin-deep fragrance leaves an unforgettable impression." Supreme Bouquet ~ "The radiant burst of a bouquet of white flower, a blend of whimsical tuberose, exotic ylang and enigmatic jasmine. Their blossoms drenched in luscious fruit and animal scents, fully spread their opulence. As a counterpoint, the vibrancy of the ambery wood accord, musks and patchouli is an invitation to serenity." Majestic Rose ~ "The dense blossom of May rose releases its majestic seduction through delicious honey-scented notes. The texture of its petals is warmed by spicy and vibrant saffron accord. The flower is drenched in notes of raspberry and is then lost in the darker folds of a balsamic oud wood accord, blended with a boldly smoked essence of guaiac wood." Yves Saint Laurent Oriental Collection Noble Leather, Supreme Bouquet and Majestic Rose are available now at Harrods, in 80 ml Eau de Parfum, £185. This collection is AT LEAST two years too late. Totally agree. I guess they just didn’t want to be left out. Never too late to jump on the bandwagon I guess. Despite the various disappointments, on the theme – Mystic Woods, anyone, – and by the company, Manifesto?, I would still like to try these. I admit I am not overly eager…but hey, you never know, right? In regards to these new offerings, keep in mind, that Harrods caters to a mostly Middle Eastern population. I was there last month and the rose, patch and oud fragrances are very popular and they were selling well from what I could see. On a side note, the 2nd floor of Harrods smell so good!!! This is the floor where the Tax Bureau is located and a middle eastern cafe. The air is permeated with the scent of Cardamom. I was in Heaven! Very true, and I’m sure these will sell. I can’t help but get tickled about the naming process now that words are being used and used again in such a crowded space. They must have cut out little pieces of paper and written on them the words: Noble, Majestic, Supreme, Rose, Leather, Bouquet and thrown them into a mason jar. Why not just admit that Guerlain’s Les Deserts D’Orient collection was nice and that the fact that it was first to market did not sit too well with the big wigs at L’Oreal? Yep — perfume names are all word salad now. I am assuming the copy is referring to Yves Saint Laurent himself? Or is this a veiled reference to the Almighty? Or YSL Inc. has a medium now? A go between who gets the word from he-who-has-passed-on who apparently has a “never-ending passion for the elsewhere…” which is not all that surprising given where he is (or isn’t?) right now. Anyone else find this copy extremey weird? I think the marketing is cute, in that L’Occitane sort of “too easy to love, so I am suspicious of being bilked of my hard earned money for what is essentially a good product but not great”–sort of way. So I like to look, but I am not lusting! You know, I didn’t even bat an eye when I first read it, but I can see what you mean. I do assume it refers to the man, YSL and is a reference to Opium. I WANT, WANT, WANT MAJESTIC ROSE!!! This one reads, WONDERFUL and, uh, MAJESTIC!…lol.